Venus has backward rotation, which is clockwise and different from other planets in the solar system that rotate anti-clockwise. Venus backward rotation is called retrograde and makes its rotation very slow, 243 days if we compare to Earth's rotation which takes 1 day (24 hours) in Earth. A complete year is counted by how long a planet orbits the Sun, The Earth takes 365.25 days to orbit the Sun from the first spot, orbit, and return to that spot, meanwhile The Venus takes 224.7 days if we compare to Earth's orbit that takes 365.25 days. So, The Venus takes 243 days to make its actual day and 224.7 days to make its actual year. 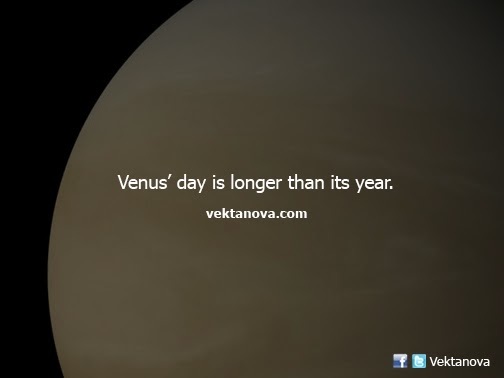 No response yet to "A Day in Venus is Longer Than Its Year"